A pleasant surprise was waiting for me this morning. Overnight I have received another award for documentary wedding photojournalism from the WPJA. This image shown above has been awarded a WPJA Honour Award. This one comes from Rose and Greg’s wedding at St Lukes Church, Silverdale, not quite a year ago, in fact it’s their first anniversary next month. It’s the second image from that wedding that has received an award. The other one is here under the title of an ‘Award for wedding photojournalism‘. 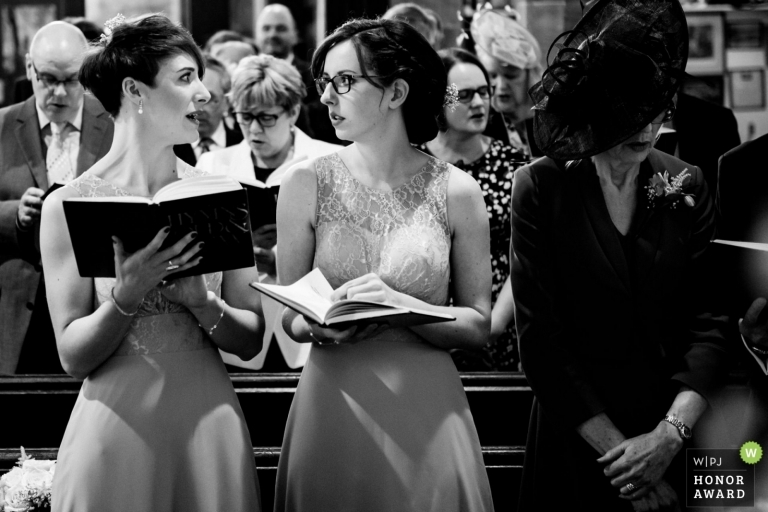 I’m not sure quite what was going on between these two, theres a variety of stories you could read into the image and the expressions on the faces of the bridesmaids. But the point is those people know what was happening. I spotted the moment developing and watched to see what would happen. For those involved it will remind them of the moment, for Rose and Greg it shows them something that was going on while they were at the altar involved in the serious business of getting married. Something they otherwise would have missed. I don’t enter images for a lot of awards, I’m not a huge joiner of clubs and associations, but the WPJA is one that I am a member of. As I’ve mentioned before there aren’t many wedding photography awards worth having frankly. Some though, like those coming from the WPJA are awarded by juries of peers rather than being social media based popularity contests. The judging is based on the intrinsic merits of the image or body of work rather than how many likes, followers or ‘votes for me’ a facebook page can drive. Here’s what the WPJA say about their judging panel. WPJA’s International cast of distinguished judges works at the very pinnacle of the profession. You’ve seen their photos on the pages of the largest and most respected newspapers and magazines in the world. They’ve been on the front lines of battlefields and of other wars against infectious diseases, poverty, and hunger. Most are educating the next generation of great photojournalists. It’s no wonder that they are held in high regard by their peers throughout the field of photojournalism. What do all these elite photojournalists, whose bios below make for a very long page, have in common? None of them are wedding photographers. At this point I’m going to quote myself from a previous blog about why the makeup of the WPJA judging panel is important to me because it holds true still. And so there you have it. Another shiny on the mantlepiece. Yay. If you would like images like this from your wedding then get in touch and let’s have a chat about it. « Wedding Photography at GG’s Yard. Steph and Stu.